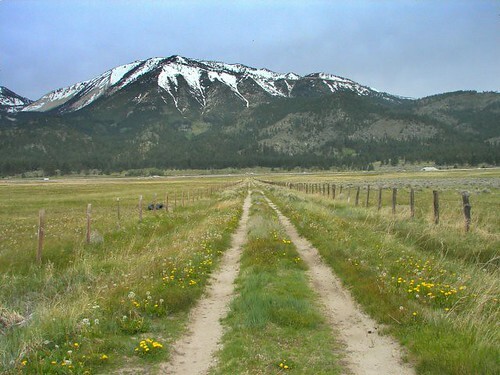 There’s an article up at washoevalley.org about the early history of Washoe Valley. But it’s not just a regular article, it’s actually a reprint of an article that was written back in 1952. And the 1952 article quotes heavily from the Nevada State Journal from 1878. And it’s all looking back at the way the Valley was in the 1860s, before the V&T Railroad was built, when the Jumbo Grade was the best way to get ore down from Virginia City to be processed at the mills. Back then the Washoe Valley was one of the busiest places in the state of Nevada. From the toll station, the Valley in the 1860’s appeared to be one long strip of industry. The great white-stone Ophir dominated the end of the causeway, and Dall’s Mill at Franktown sent forth columns of smoke from its “Barrel process” roasters. In and around Washoe City were eight more big quartz mills; the Atchison, the Manhattan, the New York, the North, the Buckeye, the Tomolee, the Napa and the Alfred. Still another, at the south end of the Valley, gave Mill City its name. The sawmills dotted the slopes on the west side of the Valley. The town swarmed over the flat, each one trying to out-do its neighbors in outward signs of prosperity, population and noise. By the 1870s the mills had moved to the Carson River near Mound House, since the railroad could bring the ore there faster than a wagon could bring it to Washoe Valley. So the Valley settled into what it is today, a quiet place to settle down and relax for some, a speed bump on the way to somewhere else for others.